Traditional Long Guayabera style – This is the traditional long sleeve guayabera shirt style with the four front pockets, pin-tucks front and back and decoration all around including the side slit. 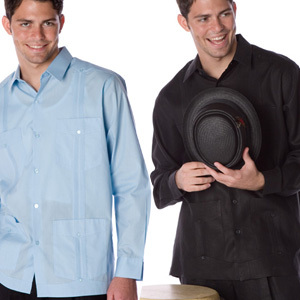 Most customers used this guayabera shirt at Destination & beach wedding attire, authentic Cuban gift, a night in Havana, traveling to Cuba or the Caribbean and doing business in Cuba or Latin America. I have all sorts of colors and styles. But rarely could I find a XL Long Sleeve Brown Guayabera shirt. Luckily I had found this online store. Again an iconic Cuban celebration. My first guayaberas were purchased in Merida, Yucatan, Mexico back in the 80's. I still have one which I love. Since then I have had guayaberas as gifts from a dealer in Miami only to see they are made in China. It is great to find a dealer that sells authentic Mexican made guayaberas. I now have a place I can depend for quality guayaberas made in Mexico and not China. As far as sizing, in a cotton blend I wear a small and at times a medium. I purchased the medium size because that was the size of the "gift" guayaberas that fit perfectly. The sizing here is more aligned to what I normally find and next time I will go with the small as the medium is slightly large on me but not that bad. So sizing is more true to normal in my situation. My only complaint is that the color of the photo did not match the color of the shirt I received. I ordered the turquoise blue but it turned out to be darker and more like the snorkel blue image. I find this color mismatch is not uncommon when shopping online. I like blue so I can live with it. Overall I would recommend My Cuban Store for guayaberas. 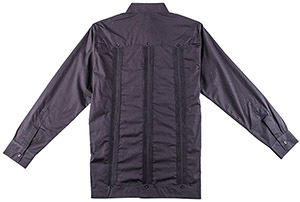 Love the product, very solid and strong fabric, great colour. Fast shipping too.